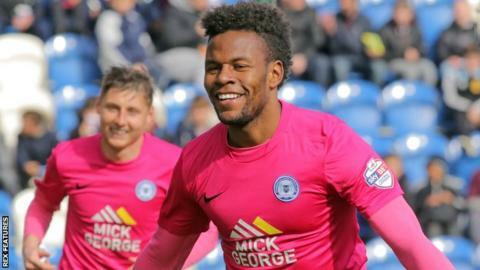 Peterborough earned a comfortable win at Colchester United to increase the hosts' League One relegation worries. Jon Taylor fired the visitors ahead early on, before Colchester's George Moncur had a penalty saved by Ben Alnwick following Ricardo Santos' foul on Elliot Lee. Lee hit the post after the break, but goals from Andrew Fox and Shaquile Coulthirst extended Posh's lead. Moncur reduced the arrears before Marcus Maddison added Posh's fourth. The U's are now nine points adrift of safety with four games left to play, while Graham Westley's Peterborough are mathematically assured of safety in 14th place. Match ends, Colchester United 1, Peterborough United 4. Second Half ends, Colchester United 1, Peterborough United 4. Goal! Colchester United 1, Peterborough United 4. Marcus Maddison (Peterborough United) right footed shot from the centre of the box to the bottom left corner following a fast break. Corner, Colchester United. Conceded by Ricardo Santos. Attempt saved. Michael Bostwick (Peterborough United) right footed shot from outside the box is saved in the bottom left corner. Andrew Fox (Peterborough United) is shown the yellow card. Jon Taylor (Peterborough United) hits the right post with a right footed shot from the right side of the box. Attempt missed. Owen Garvan (Colchester United) left footed shot from the centre of the box is just a bit too high. Attempt saved. George Moncur (Colchester United) left footed shot from the right side of the box is saved in the bottom right corner. Attempt missed. Chris Forrester (Peterborough United) right footed shot from outside the box misses to the right. Delay in match Elliot Lee (Colchester United) because of an injury. Goal! Colchester United 1, Peterborough United 3. George Moncur (Colchester United) right footed shot from the centre of the box to the top right corner following a corner. Corner, Colchester United. Conceded by Ben Alnwick. Attempt saved. Macauley Bonne (Colchester United) header from the centre of the box is saved in the centre of the goal. Attempt saved. Macauley Bonne (Colchester United) right footed shot from the centre of the box is saved in the bottom left corner. Attempt missed. George Moncur (Colchester United) left footed shot from the centre of the box misses to the left. Owen Garvan (Colchester United) wins a free kick in the defensive half. Attempt saved. Elliot Lee (Colchester United) right footed shot from outside the box is saved in the top centre of the goal. Substitution, Colchester United. Femi Akinwande replaces Chris Porter. Goal! Colchester United 0, Peterborough United 3. Shaquile Coulthirst (Peterborough United) left footed shot from the centre of the box to the bottom left corner. Assisted by Jon Taylor. Goal! Colchester United 0, Peterborough United 2. Andrew Fox (Peterborough United) right footed shot from the left side of the box to the bottom left corner. Substitution, Peterborough United. Shaquile Coulthirst replaces Aaron Williams. Substitution, Peterborough United. Andrew Fox replaces Michael Smith. Attempt blocked. Jon Taylor (Peterborough United) right footed shot from the centre of the box is blocked. Attempt saved. Elliot Lee (Colchester United) right footed shot from a difficult angle on the right is saved in the centre of the goal.